Tom Boatner, Lisa Armstrong and I rendezvoused in Nairobi, Kenya in the winter of 1990. We first climbed Mt. 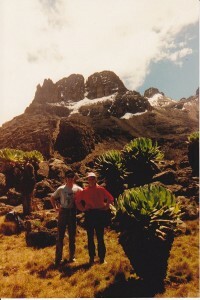 Kenya as far as Point Lenana at 16,355 ft. The vegetation, scenery and wildlife were awesome. One memory that sticks with me is having to drink boiled water out of a tire track because we’d passed all running water sources. After some wildlife tours including the Maasai Mara we crossed into Tanzania. The border guard finally gave up on my inability to understand that he wanted a bribe. Corruption and scams were rampant in East Africa. Despite that significant annoyance we enjoyed ourselves, and toured the Ngorongoro Crater before climbing Kilimanjaro. 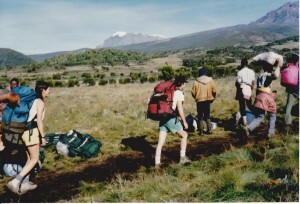 A guided trip is a requirement for climbing Kilimanjaro. Climbing from tropical forest to glaciers was a unique experience. We were amused at seeing packers carrying fancy backpacks on their heads. 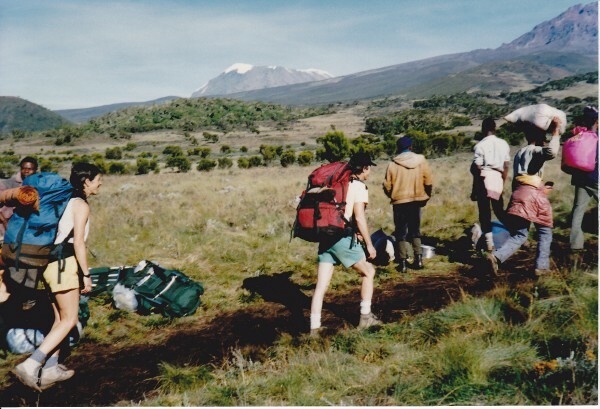 The altitude is significant on Kilimanjaro at 19,341′ (5,895 m). Beyond that, it was a fairly easy climb as long as we paced ourselves. 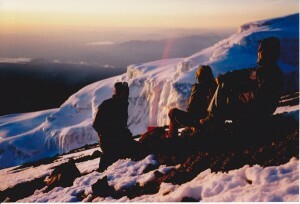 Speaking of which, we almost had to drag our “guide” to the summit.